If you install a junk spaceship or other space detritus in a sacred space and then pat yourself on the back for increasing your visitor numbers by 600% to 58,000, does that glorify God or constitute an effective approach to mission? And we’re talking here about the centuries-old mission of proclaiming the gospel afresh to each generation and culture; not the starship type of five-year mission to explore strange new worlds, to seek out new life and new civilizations, to boldly go where no man has gone before. 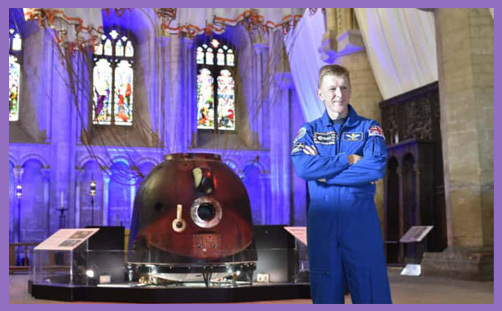 Peterborough Cathedral installed Tim Peake’s spaceship in its nave and tweeted the good news to the world. That was the good news of the 600% increase in visitor numbers; not the Good News of Jesus Christ and that 58,000 people have repented of their sins and come to know Him as Lord and Saviour. Ye men and women of Peterborough, in all things, I perceive that ye are very religious. For as I passed along, and observed the objects of your worship, I found also a spaceship with this inscription, TIM PEAKE’S SPACECRAFT. What therefore ye worship in ignorance, this I set forth unto you. If St Paul’s Cathedral hosts a complete cycle of Beethoven symphonies or piano sonatas, do they add 20,000 to their visitor numbers and rejoice that 14 of them wanted to talk about God and the concord of sound? 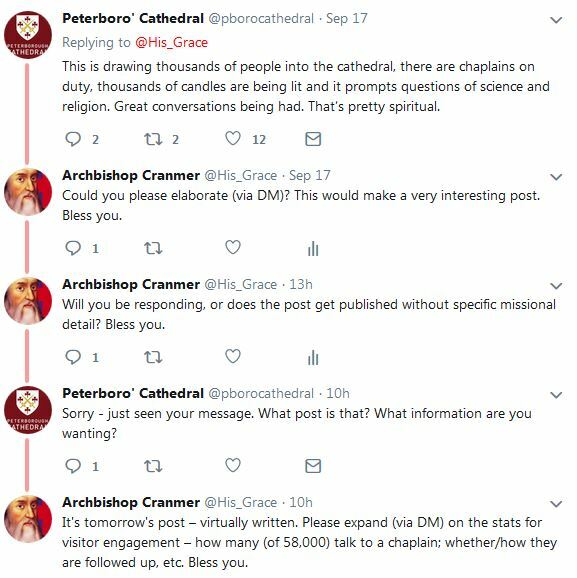 If the Royal Shakespeare Company performs the Bard’s entire canon in Westminster Abbey, does the Dean tweet his joy that an extra 74,000 people have visited and that candle sales have soared? Surely, if you fill your cathedral with interesting exhibitions and curios, the footfall will increase because of people’s fascination with creation; not out of any increased interest in seeking the Creator? Or is the missional model one of believing that by gawping at creation the Creator might be found? It’s nothing new, of course. If your cathedral or church happens to posses a bit of Jesus’s cross or his burial shroud, or perhaps the finger, ear or spleen of some saint or other, pilgrims will journey from the four corners of the earth to kiss this shrine. And candles will be lit, offerings increase, and clergy will doubtless have a few more interesting conversations. But (Article XXII aside) there is something sacred in the communion of the saints which points directly to God Himself: when people contemplate the attribution of especial holiness to the very special dead, the martyrs, there is a divine presence and power; a space where the veil between heaven and earth is rent, and Christ’s victory is joyfully affirmed. But Tim Peake’s spaceship is a paean of another victory; not of what a man called Jesus can do, but of what a man called Tim Peake has done. The celebration is of human ingenuity and cosmic triumph; of scientific facts and the hope of boldly going even further where no man has gone before. It is a shrine not to holiness, but to the cult of scientific positivism and materialistic devotion. It is, in one sense, like the bogus saintly relics of medieval Christendom, witnessing to legendary miracles and fictitious themes of worship. People visit to stare at it superstitiously; to touch it in the hope of universal healing or to understand wisdom unknown. Does the cult of the spaceship point to God, the high and holy Redeemer in all His transcendent majesty? When Her Majesty the Queen dies and lies in state in Westminster Hall, will Black Rod announce to the world that an extra 874,000 visited Parliament that week, which was a 80,000% increase on the same week last year and was, in fact, its best week ever? Or would there be some humility of understanding that people came to experience a different liturgy; not one of marble statues or political statutes, but of love, treasured devotion and spiritual indebtedness? 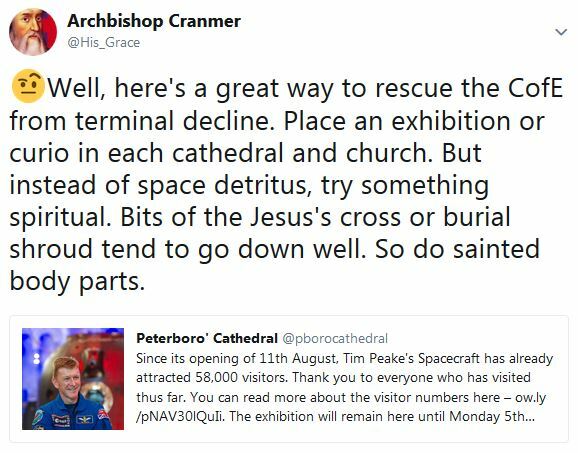 For sure, Tim Peake’s spaceship might awaken a few thoughts of finitude, but Peterborough Cathedral has not responded to enquiries about how its presence furthers the church’s mission or enhances spiritual understanding. “Great conversations being had,” they say, somewhat defensively. “That’s pretty spiritual.” Certainly, if chaplains are radiating the presence of God and sanctifying every question with prayer, there is spiritual life, for there is no division between what is religious and what is secular: by grace, our natural actions may be turned into actions of religion. So let us hear the witness of the interweaving of cosmic grandeur and sensitivity to the things of the Spirit; of those who found spontaneous expression of faith impulses or mystical awakening. We really don’t want to hear about a 600% increase in the number of visitors, for if Westminster Abbey were to open its lavatories for free and public use, the Dean would not mistake people’s desire for bodily comfort for their seeking God in silence and simplicity.